There are a couple mistakes she makes. First off, she cites cases that are the result of importation of measles, rather than sustained endemic transmission, and claims that measles was never eliminated. She apparently does not understand that "eliminated" means the sustained, endemic transmission no longer occurs. Second, she scoffs at the 1-3 per 1,000 risk of death from measles because there has not been a measles death since 2003. But is she right to do so? Let's start by counting up all of the cases that have occurred since 2000. We get 1,372 cases. If we look only at cases since 2003, as she does later on, we have 1,126 cases. She makes the assumption that there was one death in 2003. If that were true (it's not, more on this in a second), we find that the death rate was either 0.7 per 1,000 or 0.9 per 1,000. Close to the 1-3 deaths per 1,000 cases figure. 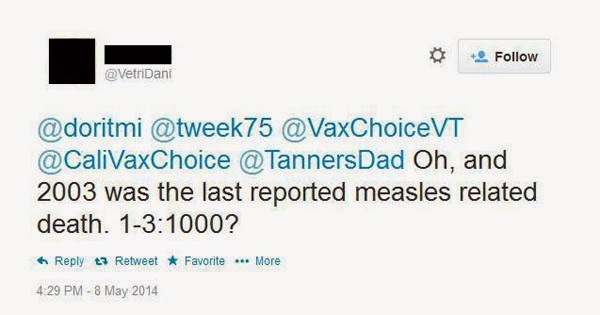 But, there were actually two deaths in 2003., according to Epidemiology of Measles - United States, 2001-2003. So the rate is actually 1.6-1.7 per 1,000, depending on whether you start with 2000 or 2003. That's comfortably within the expected rate of death from measles. That's a very simplified way to look at the numbers. We would expect to see anywhere from 1-2 deaths per 1,000 cases to 1 death per 3,000 cases. And when we look back at recent measles outbreaks in the U.S., we see a figure that fits that estimate. The problem is that we don't know who will be that 1, nor out of which bunch of 1,000-3,000 cases. Every single person who gets measles has that risk. We might see a dozen deaths in some outbreak as a statistical fluke, where each of those 12 happened to be the 1 in a 1,000. This is where the anti-vaccine activist will try to continue to ignore the impact of measles by looking for any flaw in the decedent's health. If they were not 100% perfectly healthy, then clearly it was whatever illness they had that did them in. It's a very callous way of looking at things and shows a gross disregard for others. This is not surprising, as anti-vaccine types tend to be very centered on themselves, taking a "me and mine (but mostly me)" stance, blissfully ignoring that they cannot know if they or their children will be that 1 in 1,000. 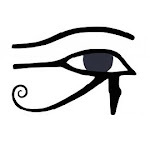 To even consider that would threaten their worldview, so cognitive dissonance sets in, and they sail blissfully on. With the recent increases in measles cases (as of today, May 9, there have been 161 cases already this year, an alarmingly high incidence), it is only a matter of time before we not only begin to see endemic transmission, but more deaths. But that doesn't have to happen. If people vaccinate, we can bring the incidence back down. If enough people are immunized worldwide, we can eventually completely eradicate measles. If we can do that, then we won't need the disease vaccine any more, and there will be one less vaccine on the list. Strangely, anti-vaccine activists, despite their cries of "too many, too soon", are working against the reduction of the number of vaccines kids receive. 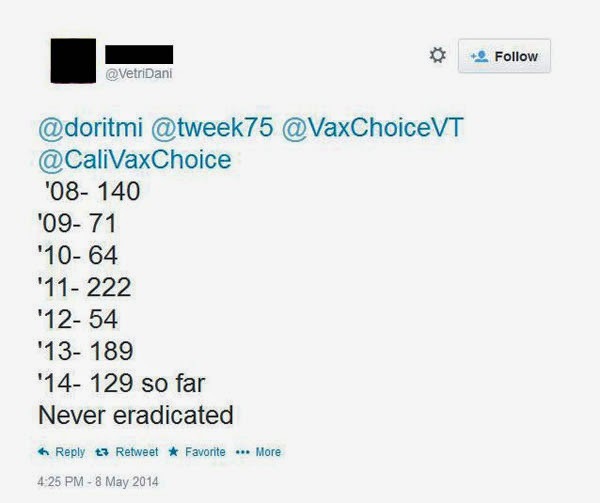 Time and time again, anti-vaccine folk display an astonishing innumeracy. Whether it be trying to argue the disease isn't dangerous and proving themselves wrong with their own numbers, or not understanding what happens in an outbreak when we're dealing with large numbers, anti-vaxers and math just don't mix. The way that I explain the risk to the uninitiated is for them to think of a big gun with a barrel capable of holding 1,000 bullets. One lonely bullet is then put into the barrel and people start playing Russian roulette with it. If all they hear is a click and no detonation, they only get measles. If they hear a detonation, they get measles and death. If you pass around the gun, most of the people will get a click and no bullet. You can pass it around to 1,000 people and never get the bullet. You can even go over the 1,000 mark and not get a bullet for a while. It's all about chance and odds and randomness and stuff. Because we don't see thousands upon thousands of cases anymore, that statistic of complications in 1 to 3 per 1,000 may not hold up. Thankfully, we hit the "reset" button on the chances of complications each time a transmission chain is cut (due to nothing but vaccinated/immune people). Statistically speaking, you'd need about 5,000 sustained cases in one big outbreak (almost like what Wales saw a couple of years back) to see that statistic come alive. Thanks, Ren. And the 1,000-chamber revolver is a good analogy. I may have to steal that. Great post Todd and you hit on all the important points of how to parse measles case-fatality rates. Anti-vaxxers don't understand even basic epidemiology and for some strange reason believe that nature occurs in some predictable linear fashion. It doesn't and that goes for their goofy supplements and herbal remedies as well. I don't know if you are as prickly of pedantry as our friend but this"
If we can do that, then we won't need the disease any more, and there will be one less vaccine on the list. Change "disease" to "vaccine" and it's correct; I know that it was just a slip. I'm not all that prickly about people pointing out my typos, especially when it drastically changes the meaning. Struck out the offending word and put the right one in. Thanks! 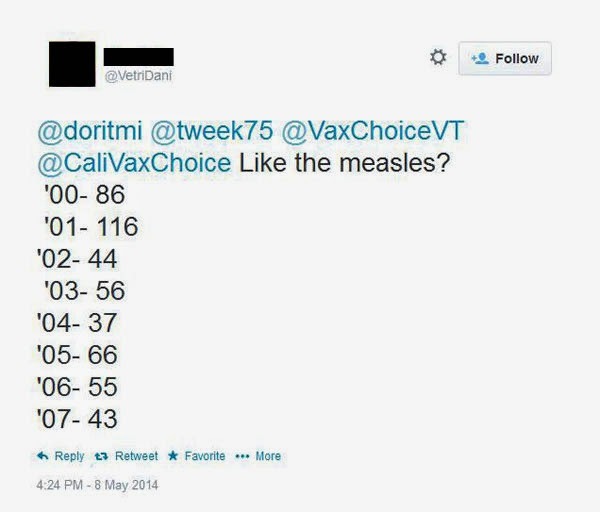 Remember, these are the same people who think we don't have to vaccinate because the chances of getting measles, mumps, pertussis, diphtheria, etc is very low in the USA. They say that because there are fewer than a certain number each year. "Chris, lets presume for minute that you are correct and that the reason these diseases are not found much anymore is due to vaccinations. As I asked in my article, what are the criteria for determining when a vaccination is no longer necessary?" Aargh. I asked her several times to thank her responsible neighbors who vaccinate for protecting her family from diseases with community immunity. She never responded to that.